Can a Cool Mist Humidifier Be Used in the Summer? 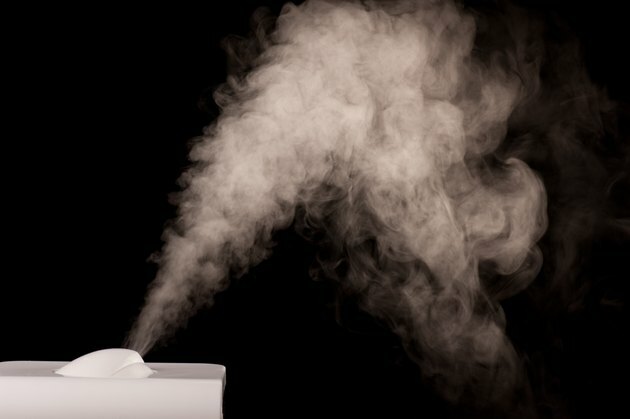 A cool mist humidifier is used to treat nasal and chest congestion from the common cold, allergies or a sinus infection, according to MayoClinic.com. Use a cool mist humidifier during the spring and summer months when pollen and mold counts are at their annual high and the air conditioner is removing moisture from the air. The sinus cavity is composed of sensitive tissue that is easily inflamed when it becomes irritated from dry air. A cool mist humidifier also helps sooth swollen sinus cavities, providing better breathing through the nose. Cool mist humidifiers come in three different types: ultrasonic, wick-based and a vaporizer. An ultrasonic humidifier uses sound waves to break water particles up into small particles that are inserted into the air. Ultrasonic humidifiers are quiet and produce a visible mist. Wick-based humidifiers use a spongelike wick that absorbs water. A fan blows over the wick and produces a nonvisible mist. Vaporizers use a spinning disk that causes the water to dispense into the air. Using a cool mist humidifier in the summer will increase moisture without increasing the temperature in the room. Cool mist humidifiers are also less expensive than warm humidifiers, according to MayoClinic.com. Warm mist humidifiers contain a heating element that boils the water, creating vapor. The heating element costs more to operate with electricity. Cool mist humidifiers also run with a gentle fan that is used for white noise. During summer months, air conditioners can dry out the air throughout a house. Dry air causes the sinuses to become inflamed and swollen, leading to nasal complications. Dry air can also make the eyes itchy and the throat itchy. The summer warmth also encourages the growth of mold spores and pollens, which cause common seasonal allergies. CoolMistHumidifier.net states that the humidity for sinus health should be between 35 percent and 50 percent. Purchase a humidistat to observe and maintain the proper moister level in the room. If the humidity rises too much, mold and bacteria can grow and make you sick. Cool mist humidifiers need to be cleaned on a daily basis. Leaving the water in the basin for more than a 24-hour period could be dangerous. Use a 10 percent bleach, 90 percent water solution to wash the parts of the humidifier. Once the filter or wick is discolored, it needs to be replaced, about once a month if used continually.